PHP which stands for Hypertext Preprocessor is a server side scripting language created by Rasmus Lerdorf in 1994. Ever since it’s emergence, PHP has grown in popularity and today, over 60% of websites use PHP. Some of the popular websites built with PHP include Facebook, Tumblr, wikipedia, Yahoo, Flickr, WordPress and much more. For students yearning to venture into the field of web development, having a good grasp of PHP is key and so are good grades in your PHP classes. However, most students have had trouble tackling their PHP assignments because just like any other programming language, becoming good at PHP requires massive practice. Some of the assignments you may encounter as a student are too complex and way beyond your scope of knowledge. When faced with such tough assignments, programming assignments is the website to reach out to and ensure you have top grades even on tough assignments. Through our PHP assignment help service, you will get quality homework solutions which are professionally done and which will fetch you the best grades. 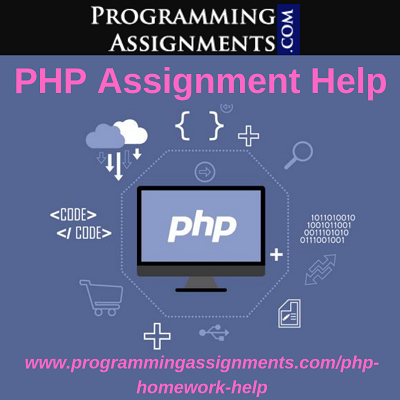 At programmingassignments.com, we understand the challenge students face with PHP programming assignments. We, therefore, brought together expert PHP programmers in bid to avail to you the most reliable online PHP homework help service at the best prices possible. Our priority lies in providing quality and reliable services to our clients. We always ensure that all the solutions we send out to our clients are top-notch and will get them the grades they deserve. Our developers are very reliable as well is delivering well-tailored solutions and for this reason, most of our clients have stuck with us over the years. We do not in any way condone practices of Plagiarism. When you reach out to us for PHP assignment help, we ensure that all your code is written from scratch and therefore its authenticity is very valid. We understand that most students have no sources of income of their own. Being the majority of our client base, we seek to make our services as pocket-friendly as possible in order to reach out to many students and help them with their assignments. We are always available and ready get started on your assignment any day, any time. This is also important in cases where clients want to check for assignment progress or just require some clarification from our customer support unit. Click here to read more about php assignment!